ELIZABETH CITY, NC – Last month we blogged about Dodge’s connection to the Fast and Furious series. Dodge is well represented in the newest installment Furious 7 , especially the Dodge Challenger Hellcat and Dodge Charger. Dodge strikes gold with Furious 7, and since our original blog post on March 11th, the Dodge Hellcat became back-ordered, and orders had to be stopped because of the OVERWHELMING interest in the vehicle. The Hellcat has an impressive 707 h.p under its hood, and is definitely the “car star” of the new film. The timing could not be more perfect for Dodge, with the auto company attempting to establish itself as the performance divisions of Fiat Chrysler Automobiles. Many performance care enthusiasts have always known of Dodge’s top cars, but now with Furious 7 , the new Dodge Hellcat is exposing itself to pop-culture and more mainstream buyers. Dodge strikes gold with Furious 7, and the automaker is truly seeing the success of this important product placement campaign. “When you put your car front and center on a global stage like the ‘Fast (and Furious)’ franchise, now everyone gets to see what fuels the passion.” Says Dodge brand CEO Tim Kuniskis. 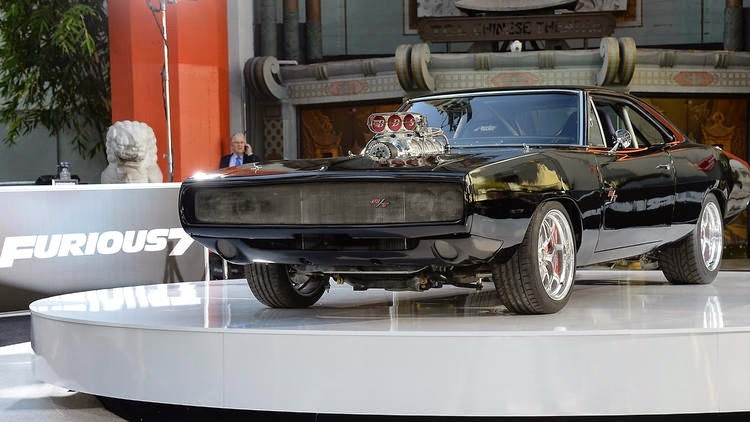 And it is not just the Dodge Hellcat that is getting all of the attention, a replica of the 1070 Dodge Charger – driven by actor Vin Diesel in the film – was rotated on a turntable at the world premiere Wednesday night. Dodge has hit the product placement goldmine, having been partnered with the Furious series, and with the updated Chargers and Challengers just hitting the market, the timing could not be more perfect for the automaker!